I want to unfold. Let no place in me hold itself closed, for where I am closed, I am false. It has been over two years since Igor and I have traveled across the Atlantic at the same time together. I had a grin of excitement on the plane when the woman next to us asked me what I do for a living. The answer dawned on me: “We are professional meditators”. As a flash, it came, with a wonderful feeling of how grateful I was to be able to give myself to the Divine and the time to give myself to this practice every day. Now the transcendental has become THE very air-I-breathe, the consuming passion of this life. 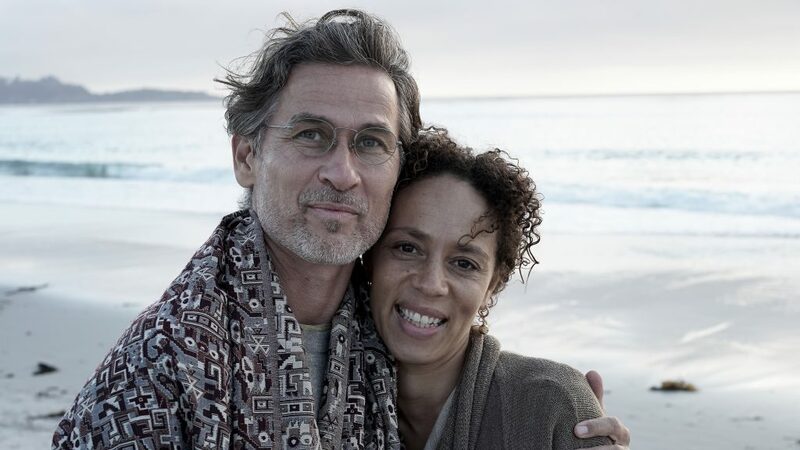 I was looking forward to being with our sangha – our spiritual family again, for a warm and intimately telling time together, diving into yet another adventure in consciousness, not knowing what will be born. 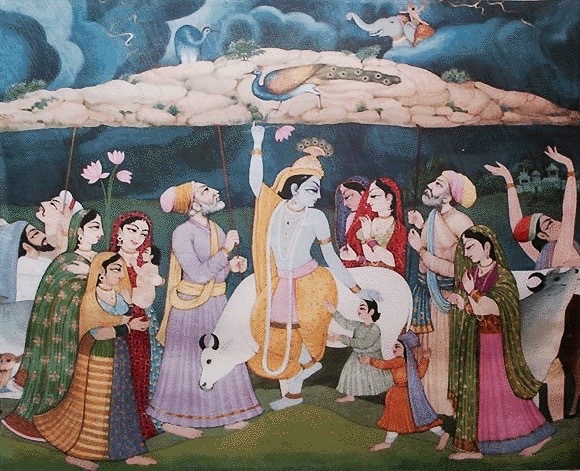 Igor paints in front of our eyes the myth of Lord Krishna lifting the mountain of Govardhan with the villagers by his side supporting Lord’s efforts— and the bigger picture of the world and our place in it gains another dimension. This house holds a lot of magic for us, as we first came here for retreats in Spring 2014. Since then we have held four retreats here, Igor’s Shakti is embedded into the walls, and the practice here always brings about transformation right from the start as have all group meditations with Igor since his starting of the transmission of Grace. This time, the weather has been pleasant, juxtaposing the internal climate of the mind, which is subjecting me to a fair bit of nonsense, and often uncomfortable incessant rambling. 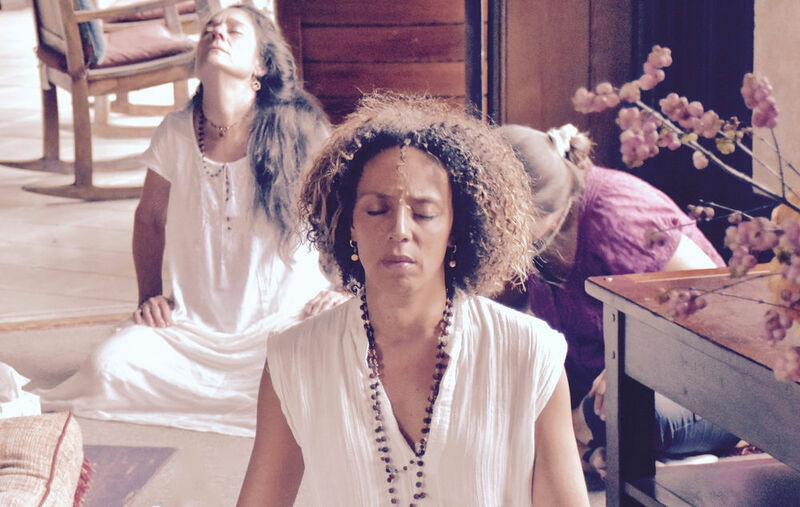 My intention for this immersion is to loosen up more space, to allow for more perfect expression of Peace-within. I was not expecting what was in store for me — that I would end up with the sense of being more connected, heard and healed. In September 2013, we were in London for Igor’s interview with Iain and Renate McNay for Conscious TV. Sharing a meal on the eve of the interview, Renate asked Igor “why Emma (my name at the time) was not awakened?”. His reply surprised even me, that “she is not ready, her responsibility as the mother of small children takes priority, it’s not her time yet”. I felt puzzled, it seemed unfair. I questioned this internally. I had glimpses of mystical experiences in my youth and the voice of the Divine was within me, yet the question arose “was my life meant to be the sacrifice to raise children without being privileged to actualize my higher potential?” Deep yearning was born and for many months I sat with this as it churned me inside. At the immersion entitled “Feminine Powers of God,” in October 2014, three years ago this month, during one of the Q&A sessions, I confronted Igor with why I am not awakened. I was happy with my meditations up to this point, blessed with images of light and peacefulness, yet I felt I had this innate wisdom of that what Igor is speaking about and that something was missing. It took me some courage to ask the question yet something inside me felt that it cannot hide. 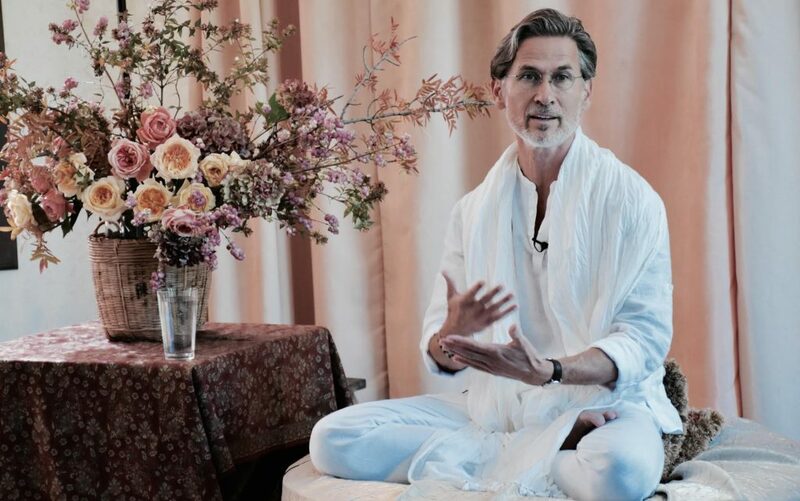 Igor gave me a simple reply that it was merely where I was at in my process, there was no need to rush into awakening Kundalini, and that my container was being prepared. He added in a sweet tone that he hoped that I would have “…the smoothest and easiest of awakenings.” Knowing that he worked with many people who have suffered from complications in improper awakening processes, I accepted his wish with my hands in pranams yet still felt confused and a little frustrated. It was the following day in a darshan where a student spoke to Igor about Tantric practices; I caught this deep wave of introspection and a burning probing in which the world around me just disappeared. Something took me, it was as if I was underwater, and this something was longing to be heard. As if being hit by a lightning bolt, I was on the floor, catapulted out of my chair by a force at the base of my spine. Life was transformed in that instant; I was stunned at the energy coursing through my body, making my legs twitch, the sound which came through me was perhaps not very beautiful, as others in the room were not happy to hear it. The whole thing was just as messy and noisy as childbirth. Our children were in the next room, and during the commotion of people coming and going in the room happened, our son slipped into the room and lay quietly on my chest, as we both lay on the floor in peace. It took some moments of just being still, I remember I felt very alone as after that, everyone just left me to be. I could barely walk, yet managed to go with the kids to the park and just space out.I remember wondering why I had been left alone by others and Igor when this had happened, but I guess we are all meant to be alone on the walk to the Holy Valley — just as we arrive here into this world. Inquiring into this, I felt a longing to know love and to Be love, reflecting how we often seek it in the other beings around us, yet it is always the love from within, love is God. I naturally keep sensing this in myself, and from here in the heart continue this journey. The familiar view from the huge windows in the room gives us a panoramic perspective of the towering redwood trees which surround the building. I sit and contemplate the boundlessness of awareness and wonder as I revisit this time in my memory. I am humbled by the love Igor gave me even if it was perceived as being tough love and for the feeling of unbearable longing for God he has ignited here. The gift for me now is knowing he has always had my best interests at his heart. How merciful is this love and yet how confusing it is too, anyone outside of this situation could easily misread what was really happening. It took a long time to be able to see from where Igor is standing, to see the whole picture. My mind grasps at this yet can only stop in wonder, then become still, and I rest in the significance of this love. I don’t need to fully understand it yet. The smell of the redwoods, with their earthy, grounding, almost Eucalyptus tones are everywhere, as the doors are opened, and the warm scented air comes wafting into the room. The nature surrounding us beautifully sets the tone for grounded, heart-based healing. I recall the timeless wisdom from Igor to recognize in human birth the seed of a mighty tree, which is Divinity. A seed breaks into a sprout, into a stem to form a trunk, and into brunches and leaves, and to deliver a fruit. It is always in a state of becoming something more expansive. It is much like the spiritual path for me, and Igor helped me see this. Enlightenment is a gradual becoming, as the seed contains the tree, and then one is, to my understanding, making a deepening into Knowing. Until then we need to create new grooves of subtler attention, which is what I understand Igor’s supremely practical discourses inspire us towards. We all sit in meditation and breath as Igor guides us in. The field that’s been created is sturdy and thick with the Shakti. The mind wavers between the focus of the mantra and posture. The phenomena of involuntary movements, called ”kriyas” begins tinging and moving like a snake through me. The sensations start in the hands as heat and then proceed to the jaw. The prana in the Hara pushes out a sound which resonates in my heart and the upper palate of the mouth. I relax into the divine currents of sound as it moves through my body in waves of bliss, as the note that sings through this body disperses; the wave spreads over the head and shoulders, as a bliss shower that moves downwards. The kriyas repeat a few times, and then this One goes silent, an experience that feels ever-new. When a particularly intense meditation was over, Igor took us out of the rest with his usual chanting of “Purnamadah Purnamidam,” and then he asked all men to leave the room. All ladies in the room sat closer to him, and with his gaze lowered, he said he had a calling for us ladies to gather together in a circle, and walked out of the room. Instantly a genuine wave of reverent jubilation to sit further was expressed by all us females. We formed a circle to be with each other and feel into what had been denied, violated or perceived as an obstacle from the past, and to praise and accept simply whatever was. The many faces of Shakti showed themselves, these foundational energies which are living fields of expression with their own characteristics with their own thoughts and patterns yearned to be seen in their multiplicity and honored as Consciousness in female form. We related to each other in silence or story, each searching for solace and refuge in the Divine Mother in each other. For myself, I find listening to others stories important to understanding my role as a woman. It was subtle, yet to be met by the tribe in the clear mirror of our sacred circle was one of the most healing moments for me as a being in time and space — what happened was beyond us all. What happened between us could be misunderstood as just the words that were expressed, yet we felt this meeting spoke to all of humanity to be seen, touched and fall into Self-empowerment. It felt as if we were being asked to send a flare of light into that what was most in tension at that moment coming out of meditation. Shine the light on what was in the subconscious and to let it out without a filter to be seen and hear. Most of us carry these energies as feelings and deny them in their pure state. We carry them without realizing they are not part of us, they become part of “our story” when we attach to them as if addicted to them. Instead of feeling these archetypal energies as they run through us and not being attached and even worse attaching a false story to them. For example “Oh I feel like this because this person happened to tell me … or this is why I am like that”. Yet there is so much beauty in just feeling without attachment but just to know these as different energies just as there is a full spectrum of colors we can see we are a full spectrum of feelings. On a physical level at one point I couldn’t breathe, as some energy got freed up inside me. Someone afterward said it was pranayama yet this was somehow more like an explosion in my heart. As our dear Karen uttered the words “ Yes, I do know that I came here to learn to love.” In the others, I heard them re-affirming that we all share so many experiences where we felt the lack of love when we most needed to feel it, or when we doubted our ability to truly know love and be love and how we had risen to our love and found our inner power there. It was important to be heard and to see these energies at play with their tell-tale characteristics; fragile, brave, grateful, commanding, tender, forceful, light-hearted or detached. We all saw ourselves in these familiar patterns of energy, we all saw how futile it was to look for any resolutions to our “life’s problems”, yet to really be met where we are now and to embrace it without fear was really where we all needed courage. Seeing the stumbling blocks, knowing we are fully human, knowing we all have transitions when something dies and we are being asked to grow and move in a different way. It is all part of a process of letting go of what no longer serves our greater Self, with trust and stay true to the flow in which life takes me step-by-step onwards. I trust myself to just be present, to drop into my pulse, my rhythm, and not get stuck in the small mind, and its negative grooves. The gathering came to an end by itself, and we all bowed in recognition to the Shakti which brought us together. We ecstatically linked hands and rose them to the sky as an offering to kindred spirits walking this path. Bhumi Devi (our dear sangha sister) whispered to me that Igor is a “good son,” and many of us felt the desire to thank him. The Divine Mother in all of us felt honored to be listened to instead of denied. The men of the group laid out a beautiful table setting for us on the veranda to eat a late breakfast, and the whole group felt an easeful change in the field. “Perhaps all the dragons in our lives are princesses, who are only waiting to see us act, just once, with beauty and courage. Perhaps everything terrible is, in its deepest sense, something helpless that needs our love. In my meditations since the immersion, with this new information being put into practical use thoughts are less viscous. I am now equipped to be a “dragon whisperer” and not afraid of these fluctuations. One step at a time, I welcome Igor’s invitation to ascend the ladder of my evolution. To let Grace lift me above the stormy clouds of my mind into the clearer white sky of the transparent mind. To experience Heaven on Earth, as the vast open space of the Heart. Embracing my totality of Being, I rest in the expansion of the spacious Self. I am very grateful for this active approach to embodying spirit, which is Igor’s teaching. My hope is that this sharing will give a little window into the experience of being close to his beauty, truth, and Grace. Made by Flowing Wakefulness © Copyright 2017-2019. All rights reserved.